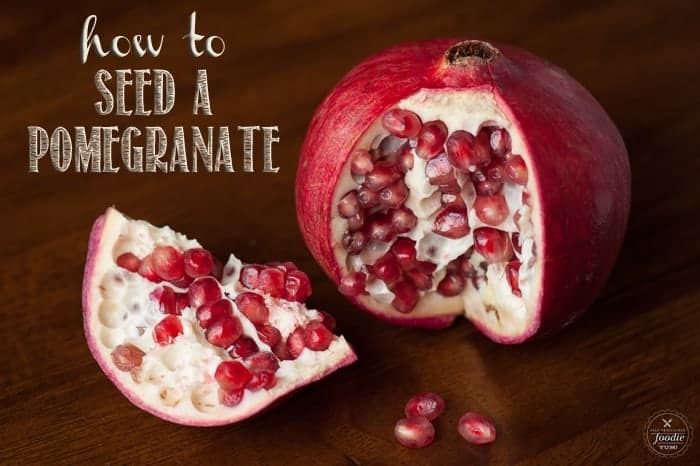 If you’ve ever wondered how to cut or how to eat a pomegranate, here are step by step instructions and a video on the easiest and cleanest method! Pomegranates are fantastic! Full of flavor and health benefits, I look forward to the winter months simply so I can enjoy fresh pomegranates. 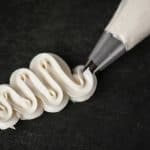 There are a few tricks to getting the seeds, or arils out cleanly, quickly, and easily. 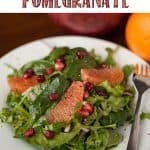 I share my method along with some fantastic pomegranate recipes below! Pin it to your TIPS & TRICKS BOARD to SAVE it for later! 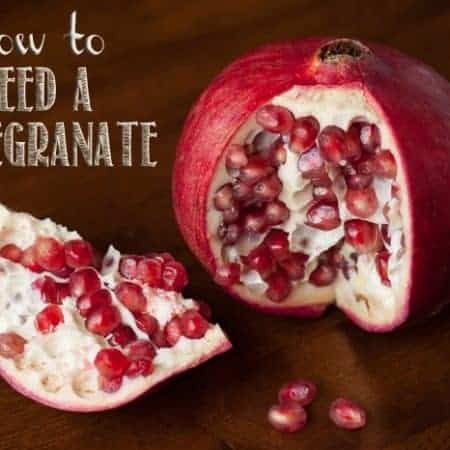 If you’ve never opened a pomegranate or you already have a method of removing the seeds, you’ll want to watch my instructions on How to Seed a Pomegranate. Your goal is to crack it open without looking like you’re walking away from a violent crime seen because you’re spattered with red. I don’t remember when I learned this trick, but I’ve never strayed. I’ve seen a lot of techniques where you cut the entire fruit in half, but I hate doing that because you slice all of the seeds in your path. I’ve also seen a trick where you beat the outside with a spoon. I have yet to try that method, simply because the way I do it works so well. There’s just something so zen about popping those seeds out too. There’s only one way to get all of the pomegranate seeds out without bruising or cutting them while at the same time preventing the juice from getting all over. The process is simple. Score the skin with a sharp knife. You want the knife to cut all the way through the skin but not through the seeds. You should be able to feel how deep you need to cut. Then, submerge the scored pomegranate into a bowl of water and use your hands to break the sections apart. Then, working one section at a time, use your fingers to gently remove the arils, or seeds, away from the skin and pith. The pomegranate seeds will sink to the bottom and the skin and membrane will float to the top. 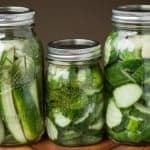 When you’re done, simply discard the skin and any white parts (or feed them to your goats like I do), drain off the water, and store the seeds in an airtight container in the refrigerator. Pomegranates are full of antioxidants. 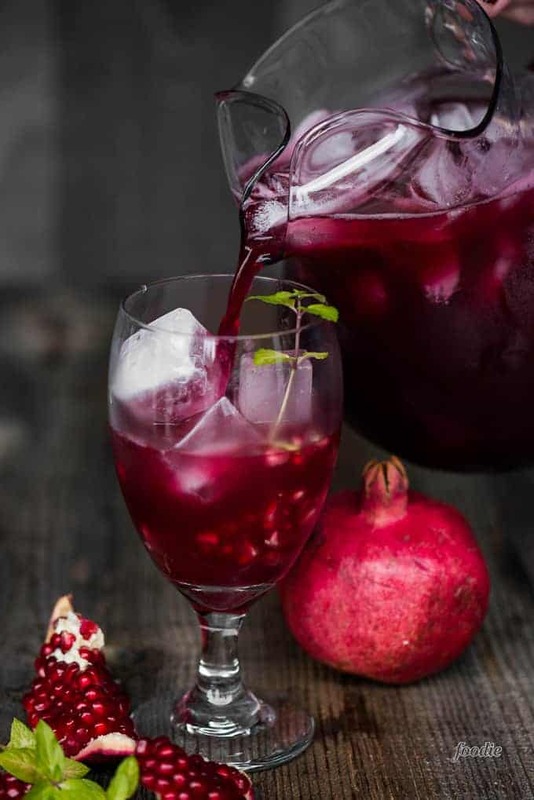 That vibrant red pomegranate juice contains polyphenols which can help remove free radicals, protect cells from damage, and reduce inflamation. This can also aid in cancer prevention. 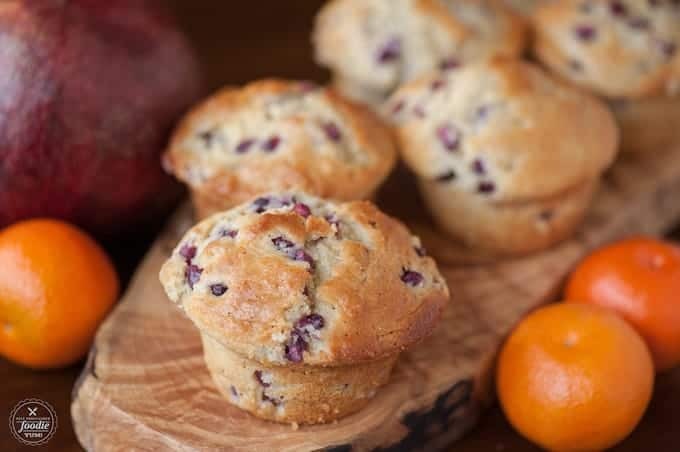 Pomegranates are full of vitamin C, which is especially great during cold and flu season. Since pomegranate juice is considered to be anti-inflammatory, it can aid in digestion and other ailments like arthritis. Pomegranates are good for your heart. Studies have shown that pomegranate juice improves circulation and can slow the growth of cholesterol. I know I look forward to November every year because that’s when Costco starts to carry big California grown pomegranates. Pomegranate season typically runs from October through February. That’s especially good for me because it’s the exact opposite of the other super fruit – the berry. If you’ve never bought a pomegranate but are ready to join in the fun, you might not know how to pick a good one. When selecting pomegranates, look for a ripe, deep-colored fruit with a red to reddish-brown outer rind that is heavy for its size. The fruit, when stored in the refrigerator, will last three to four weeks unopened. If your house isn’t too warm, they’ll last for a long time on the counter as well. The skin will get dry and dark and will be harder to cut, but the pomegranate seeds will stay beautiful inside. Once seeded, pomegranates should be enjoyed within about a week or so. They can also be frozen in a sealed bag for up to a year. How to Make the Best Charcuterie Cheese Board – pomegranate looks and tastes great here! 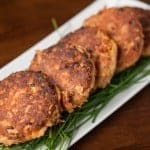 You can also toss them in a smoothie, add them to oatmeal or pancakes, or just pop a handful in your mouth! Fill a large bowl with water. Score the skin of the pomegranate, from end to end, so that you've made six sections. Submerge the scored pomegranate into the water. Wedge your fingers into the scored slices and break the pomegranate into chunks. Gently use your fingers to release the seeds from the skin. If you do this under water, you will minimize any mess. Discard all of the skin and pith. Drain the seeds and store in an airtight container in the refrigerator. 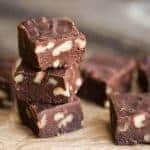 This post was originally created in November 2016 and has been updated with more fun facts and tidbits for your reading pleasure. I could not get to a video! !